Here is the lovely Sausage & Egg Scramble I made for my Mom on Christmas Eve brunch, all puffy and brown and yummy! This is a super simple and tasty breakfast casserole that turns out perfectly every time! This dish is sure to be a hit at your next breakfast or brunch. We've made this delicious casserole for many years now. It's super simple to make the night before and refrigerate. Take it out the next morning, sprinkle with paprika and pop into the oven. It's a family favorite that all of our friends love too! 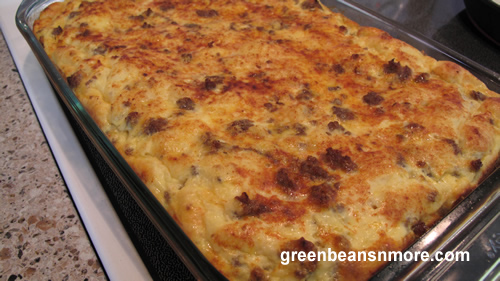 It's a perfect casserole for a Christmas brunch. You may also find this dish called Sausage & Egg Scramble. Brown sausage, drain and let cool. Add spices to the egg mixture. Add sausage, bread and cheese. Pour into a 13x9x2 greased baking dish, cover and refrigerate overnight. Remove from refrigerator 1 1/2 hours prior to baking.